Written by Kevin Boyle, Financial Controller for NSS Group – originally appeared on LinkedIn. There’s no better place to start than one of High Access’ four core values. I have always prided myself throughout my career so far, on the ability to permanently look at my work and try to make improvements to it. What may seem right today, can often change in 6 months’ time and I’ve often found myself looking at my own work thinking “What was I thinking?!”. The environment in High Access is conducive to this. Allowing the freedom to propose updates to processes or procedures and implementing new reports or actions. 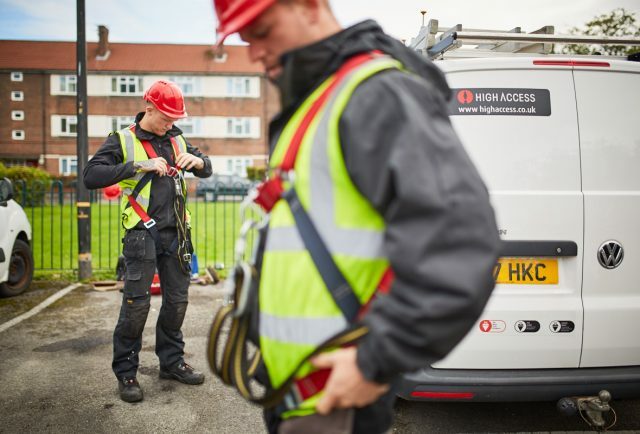 High Access is growing every day, so it is important that we as employees, continue to grow with it. I have actively implemented many new things since I came onboard and I make a point of trying to listen to all my team’s ideas, to give them the freedom to provide solutions to any issues that may arise. This creates a fantastic environment to work in, to help know that your opinion matters. Within CrossFit, continuous improvement is simply a by-product of trusting in the process, day in, day out. With everyday being different, you are improving in every area all the time. There are 10-year veteran world champions, who continue to hit personal bests, years after they’ve retired. Everyday is a new day and you get to tweak techniques, improve engines and learn new skills from many different sporting arenas. As I write this today, I PR’d my Clean and Jerk at the 6am class, I was simply delighted. This sense of achievement, carries through to all other aspects of your life, giving you a real buzz in to work life as you tackle ways to add value back into the business. The support from everyone at CrossFit Consilium is unlike anything I’ve ever experienced in a fitness setting. You turn up, do some crazily intense workout, fall exhausted to the rubber flooring and then high five each other at the end. Unlike any gym I’ve ever been to. You can be really struggling and there’ll be someone there shouting your name to get you through it. Or…you’ll be absolutely bossing it and there’ll still be someone there telling you how well you’re doing! The feeling after finishing a workout is surreal, with everyone on that post-WOD (workout of the day) haze. Whilst not necessarily under the same crazy haze of CrossFit Consilium, there is also a real sense of togetherness at High Access. More than any other company I’ve worked for. One of the beauties of working in Finance, is having the ability to work alongside colleagues from all other departments of the business. Helping colleagues to understand the numbers and to show how these numbers can help them in their own roles. I always want to add value back into the business. People are always open to learning and taking on information. Likewise, I’m also keen to understand the pressures around their roles and how I can relieve it in some way. This togetherness helps drive this company forward, particularly as we enter the new era of the NSS Group. Anyone who has taken on a CrossFit class before, will understand one of the beauties of it, is from warm up to finish, you’re in and out in the hour. This is especially helpful for people with families, busy jobs and other pressing priorities. For someone like myself, having this short, sharp hour in the morning, gets me focused for the day ahead. I’ve got in, done a great work out, showered, eaten and ready for work, all before 7:30am. It’s crazy to say but I feel more awake the days I get up early for the gym, than the days I don’t. Equally working for High Access, there is a real expectation for you to be in, out and enjoy your life away from work. A real preservation around maintaining a healthy work-life balance. Banished are the Neanderthal, in-efficient 14-hour long days I’ve seen in previous companies. This helps staff to maintain levels of engagement, efficiency and consistency in their work. overworked, stressed employees will eventually burnout or fail to perform so we try to ensure people are switched off come the end of their shift and spending quality time with their loved ones. The value of this really cannot be underestimated and for myself personally, feel it has brought out the best work in my career so far. I am a proud family man and enjoy nothing more than spending precious time with my wife and children. I actively encourage all my team to do the same. This has so many positive benefits in the long-term, that simply cannot be quantified. In conclusion, mainly due to the above, both High Access and CrossFit have had a huge impact on my 2018. Intertwined together, they have helped me develop as a person and in my career. Ironically, CrossFit has probably helped my career, just as much as joining High Access. Both help you to be consistent, determined and constantly searching for the best way forward. As we move into 2019, I hope these continue to manifest as such a huge part of my life, as I continue to try to be the best me!